I bought this little tool after watching a YouTube video by one of my favorite makeup gurus, Michelle Phan. Well, this eyelash curler is something that I used once and will never use again. My eyelashes have enough natural curl for my liking. This will have to go into the trash because I don’t think sharing would be sanitary. Side note: Krista, over at Organize the Whole Shebang, had an interesting video last week about unique and cute ways to keep your things organized. It had me thinking that I could repurpose a few (only a few) items, instead of tossing them or giving them away. Could be a bad idea, huh? See you Monday for what's in the don't keep pile! My prayers go out to everyone affected by the earthquake/tsunami in Japan. It’s Friday, so I thought I’d start off with a little clutter trivia. 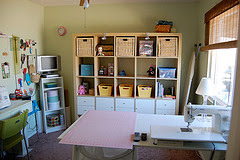 According to the National Association of Professional Organizers, we only use 20% of what we have in our homes. Wow! I have a lot of work to do. 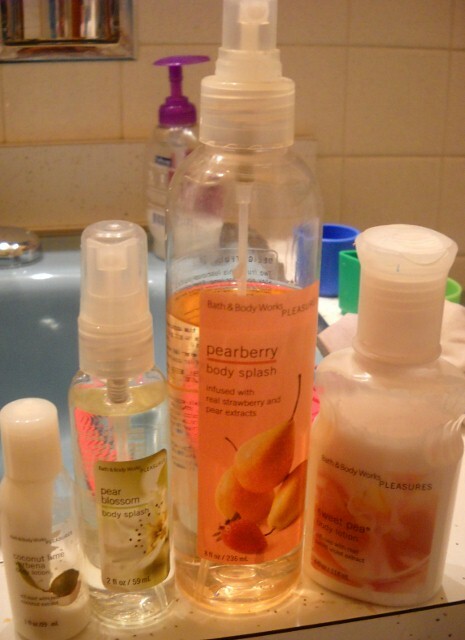 Anyway, the body lotions/splashes above--the body splash smells like alcohol. And I used most of the coconut lotion, but I can’t stand the smell of the sweet pea lotion. So why did I keep it? I feel guilty about not using things up. This group is outta here. I think I’m going to stick with bathroom items this week, so this is a big ol’ can of Crisco I bought because I read that people swear by it as a moisturizer. And I’m a sucker for cheap home remedies. Well, I went out and got this huge can, and now it’s all rancid. I just couldn’t use all of it before it went bad. But, once again, instead of throwing it out, I kept it because I didn't want to waste it. Like letting it sit in the cabinet isn't wasting it. Side note: The Crisco worked okay on my face, I guess, but I did not like it on my body. My skin felt all itchy and dry not long after I applied it, which I find odd, since it’s greasy as all get out. Today’s item is something I think I got at a baby shower for my oldest sweety girl…six years ago! My excuse for keeping this: We found out she has eczema, so I stopped using anything scented on her skin. The container is huge, and it came in a two-pack, so I felt that it was wasteful to throw it away. My house is not nasty, it’s just junky. Open any cabinet, closet, or drawer, and it is probably crammed with one too many of something. Well, after seeing a scary episode of Hoarders, I cleaned out my closet and then went to the baby clothes and toy wasteland called my kids’ room. It was there that I realized I had to do something immediately. They said, “Mommy, I want that” to everything I tried to get rid of, even those old fast-food restaurant toys. I have set a bad example for them. I feel really guilty about this. But feelings won’t change anything. So that’s why I’m here. Putting my junktified house out there for anyone and everyone to see will force me to “get it together” (one of my favorite sayings, by the way). 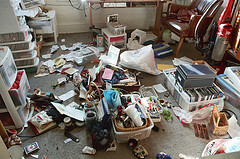 I saw the scariest thing ever on TV: Hoarders. The smell of rotting food and cat pee-poop seeped through my TV as I watched a cleaning crew remove like 20 sick cats from a defeated hoarder’s house. I almost puked when someone pulled a petrified kitty from a pile of dusty garbage. Totally judging and gagging as they went to commercial, I caught a glimpse of my own surroundings. Did I have some hoarding…umm, let’s say…tendencies? 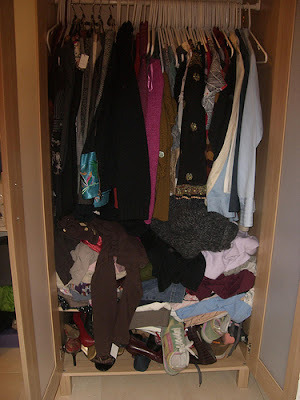 Hoarders terrified me so that I got up and threw away 80% of my grimy bedroom closet. I am not a hoarder. But I have a whole lot that needs to go into the don’t keep pile. My challenge is to eat this, making up a word, clutterphant (clutter elephant? Never mind.) one bite at a time. To this! Well, close to this. © 2011 Republishing posts in their entirety is prohibited without permission. Simple theme. Powered by Blogger.